Join the discussion on our forums! Come discuss Shadowy Figure over in our dedicated Shadowy Figure discussion topic. I know there are better combos, but I'm trying to make this work with Zerek, Master Cloner, since it copies the deathrattle condition. I played a Mechanical Whelp, played Goblin Lackey making it 3/2 Rush, and then copied it with Shadowy Figure. 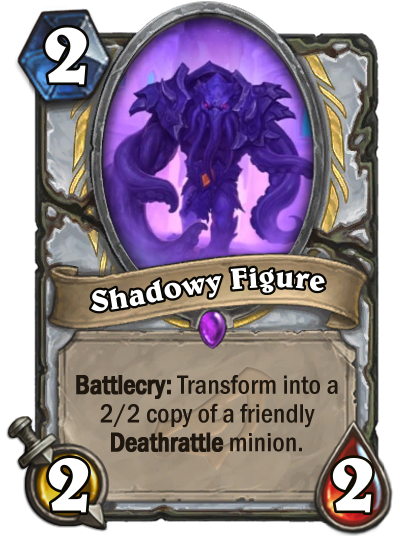 I could see when I hovered over the copied Whelp that it had two enchantments, "Short Fuse +1 Attack and Rush" followed by "Shade 2/2". But it did not actually get Rush. This ended up losing me the game as I was unable to use it to trade into the enemy board. So whether or not this is working as intended, you have been warned! Becomes taunt and removal with Convincing Infiltrator. I'm not scared of this card, I'm scared of what it could become. An obvious combo piece, but what it can combo with we don't yet know. Players will forget this card exists, then 2 expansions later it'll enable something broken..